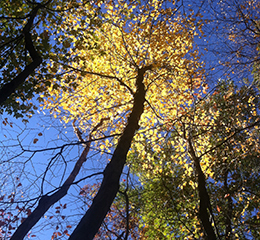 High in the mountains in dry and difficult growing conditions the Sweet Birch thrives. Common in the wild, it is rarely offered in nurseries. Everyone is so busy looking for Birch trees with showy bark that the Sweet Birch is overlooked. 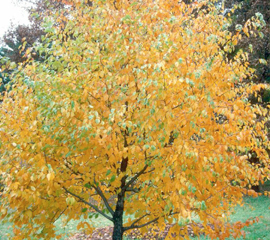 The rich summer foliage and golden fall color are reason enough to invest in this fine tree. Shows high resistance to Bronze Birch Borer and Birch Leaf Miner as well as tolerance to urban conditions and difficult growing sites. Grows 40' - 50' high. The Sweet Birch is unrivaled for its show in the fall and should be planted where this attribute can be fully enjoyed such as among evergreens or other deciduous trees with orange and red fall color. 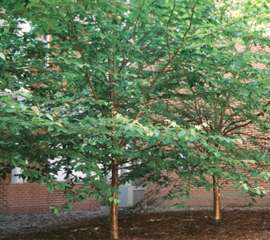 Sometimes we overdo it on filling up the garden with those showy trees / sometimes an unassuming tree that has an overall quietly attractive character will lend itself to a more restful landscape environment.